Sorry it’s taken a while to to get going and start writing again. Its been a wild few months! In February this year I entered a little cooking comp called Cheflab at my good friends Ryan and Tania’s restaurant, Baby Mammoth. After being told numerous times to keep it simple (something I found hard to do but glad I did having to make close to 70 dishes) I decided to make my own version of Hestons “Meat Fruit”. It was crazy cooking in a real commercial kitchen for that many people and I hope to be included for round 2 soon. 1. 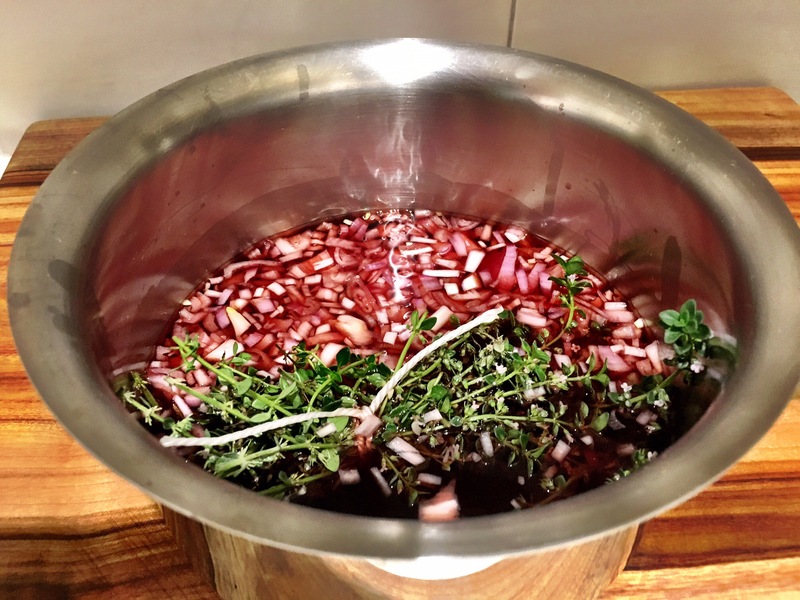 Place the shallots, garlic and thyme in a saucepan with the Madeira, ruby port, white port and brandy. Set aside to marinate for 24 hours. 2. Heat the marinated mixture until almost all the liquid has evaporated, making sure to stir regularly to prevent the shallots and garlic from burning. Remove from the heat and discard the thyme. 3. Preheat the oven to 100°C. Fill a bain-marie with 5cm water and place in the oven. Preheat a water bath to 50°C. 4. 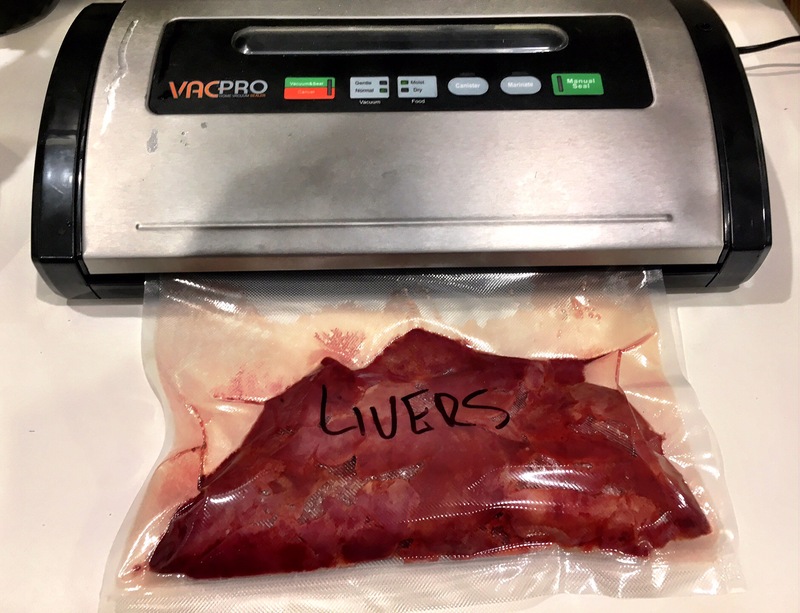 Sprinkle the table salt over the livers and put them in a sous-vide bag. 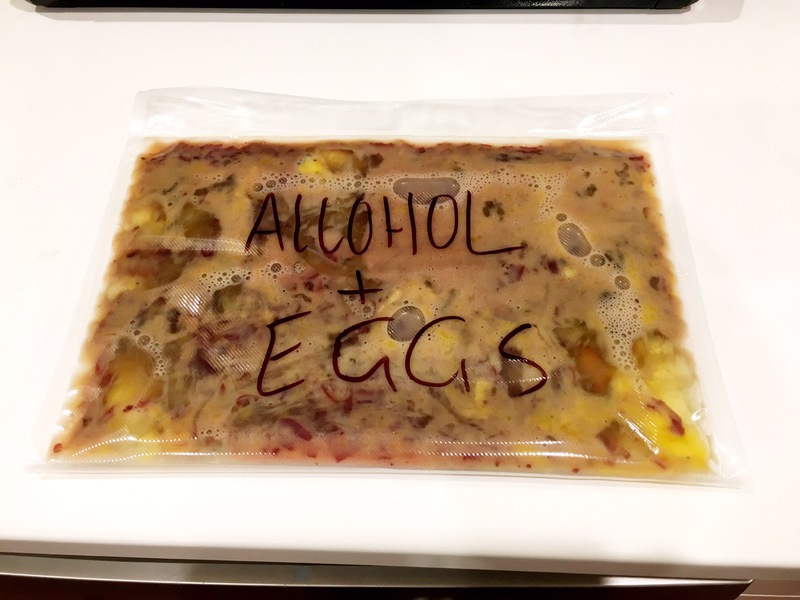 Put the eggs and the alcohol reduction in a second sous-vide bag, and the butter in a third. 5. Seal all the bags, then place in the water bath for 20 minutes. Remove the bags from the water bath. 6. Combine the eggs, alcohol reduction and meat in a blender and blend until smooth. Slowly blitz in the butter and blend until smooth. Pass the mixture through a fine sieve using the back of a small ladle. 7. Pour the mixture into a terrine dish and place in the bain-marie then cover the bain-marie with aluminum foil. Cook the parfait until the temperature in the centre reaches 64°C. Remove from the oven and allow to cool. Refrigerate for 24 hours before serving. 8. Place the gelatin in cold water to soften. 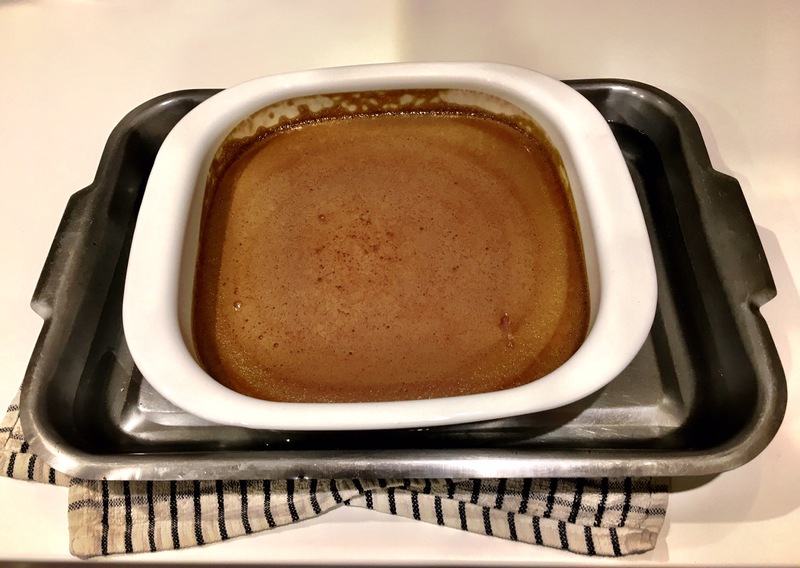 Gently heat the mandarin purée and glucose in a pan to combine. 9. Add the softened gelatin and stir well until dissolved. Remove from the heat and stir well. 10. Pass the mix through a fine sieve and reserve in the fridge until required. 11. Using a spoon, fill the egg moulds with parfait, ensuring there is enough pressure to create a completely smooth surface. Level off the tops so that they are flat and cover with Clingfilm. Gently press the Clingfilm directly onto the surface of the parfait and place in the freezer until completely frozen. 12. For the mandarin jelly use a spoon to fill the yolk moulds with the mandarin jelly, ensuring there is enough pressure to create a completely smooth the surface. Level off the tops so that they are flat and cover with Clingfilm. Gently press the Clingfilm directly onto the surface of the jelly and place in the freezer until completely frozen. 13. Once frozen remove and place both the parfait and jelly into the fridge to defrost approx 30 minutes. 14. To serve, grill some sourdough and pour a dash of olive oil to dress. 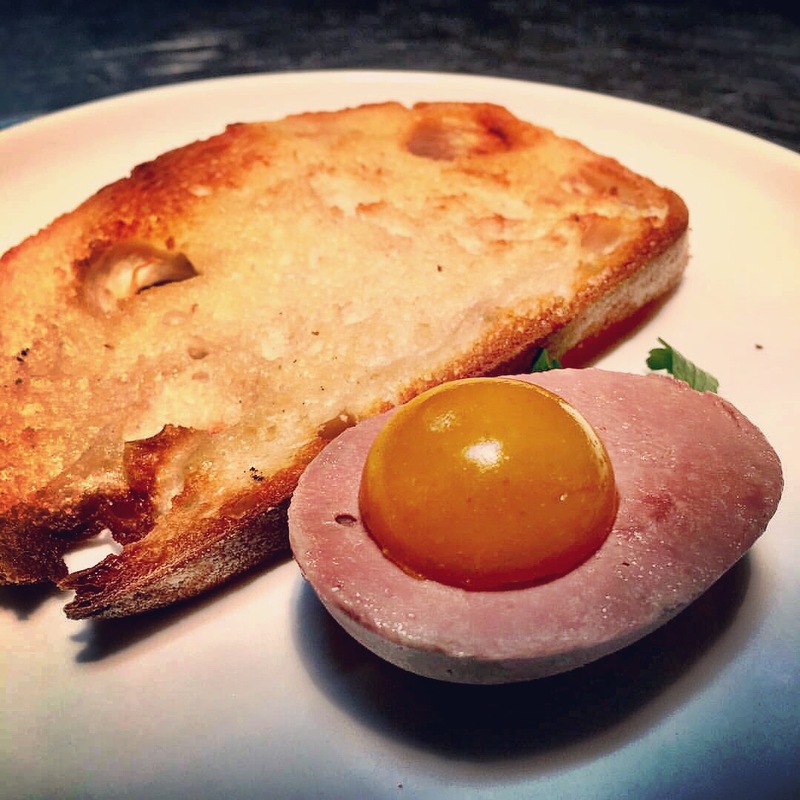 Place the parfait egg next to the toast and top with the mandarin jelly yolk. Garnish with sprig of parsley and enjoy!